Afghan politician who was elected as the President of Afghanistan in September 2014. He was previously an anthropologist who served as the Chancellor of Kabul University as well as the Finance Minister. He earned his Doctorate in Anthroplogy from Columbia University in 1982 and taught at Johns Hopkins University from 1983 to 1991. He came in second to Richard Dawkins on Foreign Policy and Prospect's poll of the Top 100 Global Thinkers in 2013. He married the Lebanese woman Rula Ghani. They have children named Miriam and Tariq. 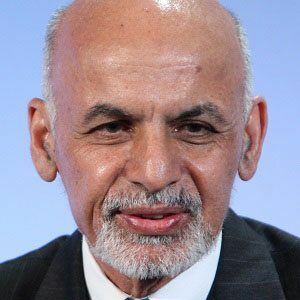 He succeeded Hamid Karzai as the President of Afghanistan in 2014.